← It’s Time to Reap the Harvest. You may think that nothing is impossible with God. 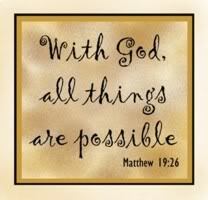 The Bible even tells us that with God, all things are possible. But, that is simply not true. There are some things that even God can’t do. God can’t lie, because if he told a lie, it would come to pass, and be the truth. God can’t do “nothing” so, I guess doing nothing is impossible for God. On the other hand, nothing is possible without God. If you’re sick, believe God for a miracle. God performs miracles; the question is will you trust him enough to let him do it for you? If you doubt his word, you won’t receive the blessing, because Jesus is a gentleman. He never forces himself on us; on the other hand, he never turns down our open invitation either. He is able and willing to meet every need in our life if we’ll only believe. He cannot lie; and he cannot fail. We sometimes get in our own way of the miracle that we so desperately seek. When we think about the past, we bring judgment on ourselves. If we think that we’re unworthy to be healed, are we possibly saying that God can’t forgive or cleanse us from sin? Is there anything too hard for my God? I think not. Thank him for your healing today, and you will be healed, in Jesus’ Name.